These Skunk Brand rolling trays serve their purpose perfectly. The large rolling tray is nice and big, so it can fit all of your custom smoke supplies. 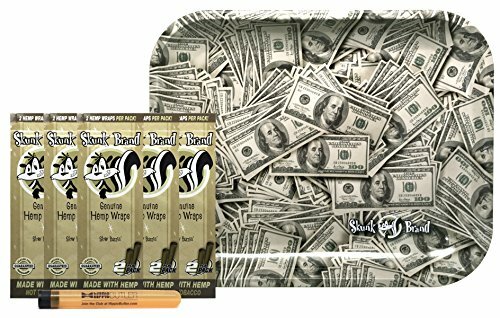 Grab your favorite pack of rolling papers, a good blend of filler, this rolling tray, and start making some smokes. The tray measures 14 x 11 inches. The Skunk hemp wrap is made of genuine hemp and come in a resealable pouch to guarantee freshness. Skunk hemp wraps feature Perfect Fold Technology, which means each wrap is folded in the perfect place for easy rolling. The tubes are made of plastic and have a rubber top. This seals in odor and prevents lint, water, or anything else you have in your pockets from getting in. They're perfect for traveling. You will receive 1 tube. Color may vary. If you have any questions about this product by Skunk Brand, Hippie Butler, contact us by completing and submitting the form below. If you are looking for a specif part number, please include it with your message.